I recently had an opportunity to view a number of older island photographs. I borrowed three to scan and post on our blog. This first photo is of a classic island home, once owned by a prominent 20th century islander and his wife. The house and property remain in the family. Some renovations have been made to the house, but it retains its beauty and charm. Please leave a comment if you think you can identify this home or if you have any noteworthy stories to share about the property or the former residents. I will publish a recent photograph of this house on tomorrow's post. And look for the other two photos in the days ahead. 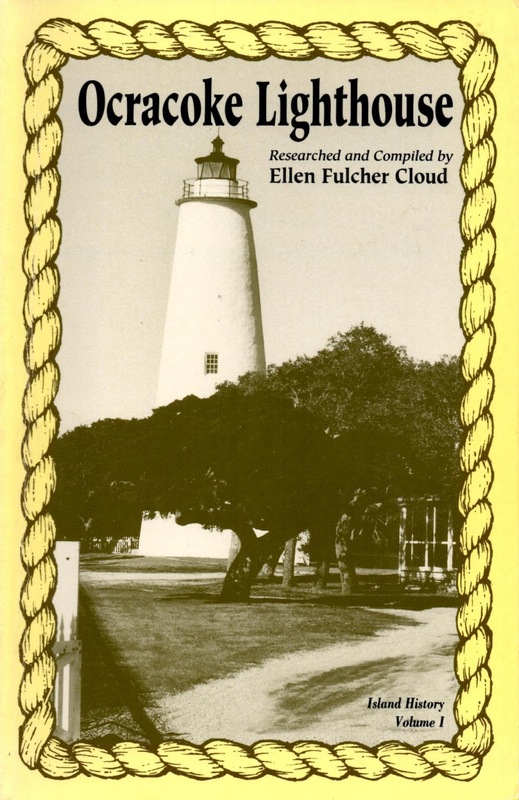 Our latest Ocracoke Newsletter is Ellen Marie Cloud's first person account of the "Great Ocracoke Lighthouse Windows Heist." You can read it here: http://www.villagecraftsmen.com/news012117.htm. After Friday's post about the submarine electric cable that serves Ocracoke Island (see photo below), I had this question from a reader: "I always wondered what a submerged cable looked like. So, does anyone know, what happens if this thing was accidentally cut while in the water? 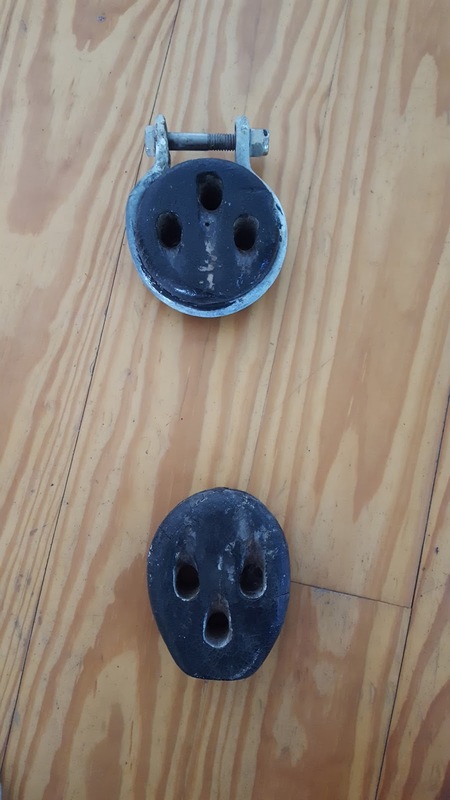 Does it trip some kind of breaker or could you technically be shocked if you were nearby? I'm imagining the world's largest GFI outlet. Does it just lay on the bottom?" This is the reply I received from Heidi Smith, Tideland Electric Membership Director of Public Relations: "It is actually sunk below Hatteras Inlet. Obviously the depth is ever changing based on shifting sand. Our previous cable would get nicked from time to time by a boat propeller, thus the new armored cable. Yes, if the energized section of cable buried deep within ever were nicked it would result in a breaker operation and shut power off." For more information about the island's electric service, especially our new microgrid, please click here: https://villagecraftsmen.blogspot.com/2016/12/microgrid.htm. And look for the story of the electrification of Ocracoke Island in a future Ocracoke Newsletter. Visitors to Ocracoke often wonder how we get electricity to the village. Although there is a 4,400 horsepower generator at Tideland Electric's facility on Odd Fellows Lane that serves the island during emergencies (as was the case after Hurricane Matthew last year), day-to-day power is provided by a large submarine cable laid under Hatteras Inlet. 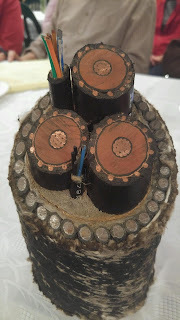 The photo above shows a small section of the four million dollar armored electric cable, with additional fiber optic cables inside, that was installed in 2005. I didn't measure the cable, but it is about 7" in diameter. In 1715 the North Carolina Colonial Assembly passed an act to settle pilots at Ocracoke Inlet. The pilots' task was to guide ships through Ocracoke Inlet and across the bar in order to bring vessels safely into Pamlico Sound. Islanders who knew the waters well were granted licenses or certificates of competency, known as branches. These individuals (there was at least one woman) were known as Branch Pilots. There was fierce competition among the pilots to be the first to reach a sailing vessel (and thus to receive payment for their services). Pilots operated in pairs. One would climb high up in a tree looking for a sail on the horizon. The other had the pilot boat ready to launch. 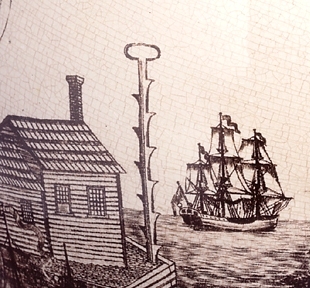 A depiction of the small settlement on Shell Castle Island (between Ocracoke and Portsmouth) includes an unusual object, a tall pole with steps carved in it, and a ring at the top. This was used by pilot lookouts since there were no trees on Shell Castle. Once the ship was reached, and the islander's services secured, the vessel was piloted through the inlet and over the bar. After the ship entered the deeper water of Pamlico Sound the pilot was picked up by his companion in the pilot boat. Hunting and decoy carving are time-honored traditions on Ocracoke Island. Years ago, when mass-produced plastic decoys were introduced, many hunters discarded their heavy wooden decoys. Some were even tossed into wood stoves and used as firewood! Eventually islanders realized that their hand-carved ducks were works of art, and were becoming collectable and quite valuable. As a result, a number of Ocracokers began making smaller decorative bird carvings (gulls, terns, wading birds, etc.) for the tourist trade. A few months ago I discovered a box of my father's unfinished carvings in the attic. 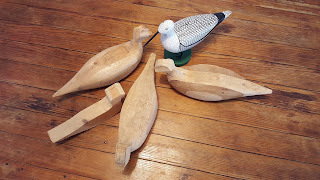 The picture below shows one small "blank," three partially finished carvings, and one completed shore bird. 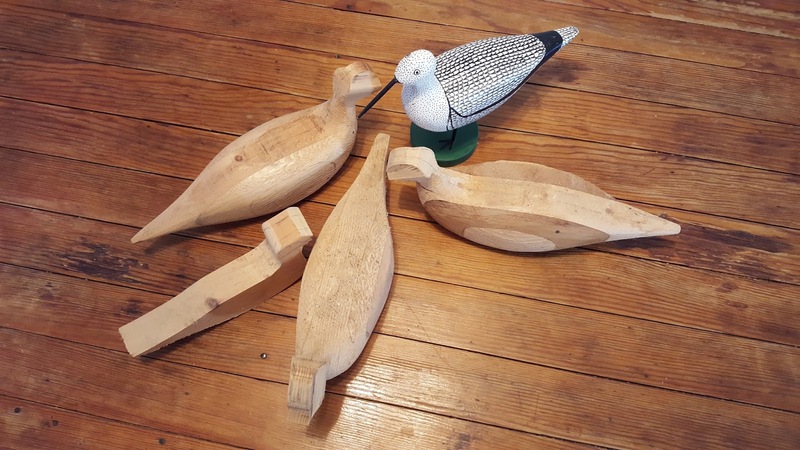 More Ocracoke Island decoys and carvings can be seen at the Preservation Museum. Stop in sometime to take a look at all of the displays. Visitors to Ocracoke are often surprised to learn that many island families have connections with Philadelphia and the surrounding area. 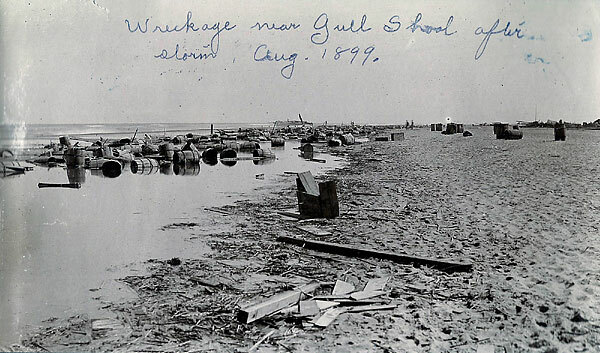 From the late 1800s through the middle of the 20th century most young men (usually at around 16 or 17 years of age) left Ocracoke to work up north on dredges and tugboats on the Delaware River. Initially, they worked with the American Dredging company of Camden, N.J., but soon they began joining crews on vessels of the U.S. Army Corps of Engineers. The men reluctantly left their island home in the spring of the year, after the ice had melted on the river, and returned "as soon as they could write their name in the frost on a scow" (as Cecil Bragg reports in his book, Ocracoke Island: Pearl of the Outer Banks). Some men married up north, and settled permanently in Pennsylvania, New Jersey, or Delaware. Some, like my father remained there until retirement, then moved back home to Ocracoke. Others continued to make the twice yearly trek, often working as fishing and hunting guides in Pamlico Sound in the fall and winter. A few stayed up north for only a year or two (or maybe even only a month or two) before returning home and eking out a living as best they could on the water. By the middle of the 20th century Ocracokers witnessed many modern developments -- electricity, ferry service, paved roads, telephones, and eventually the Internet. 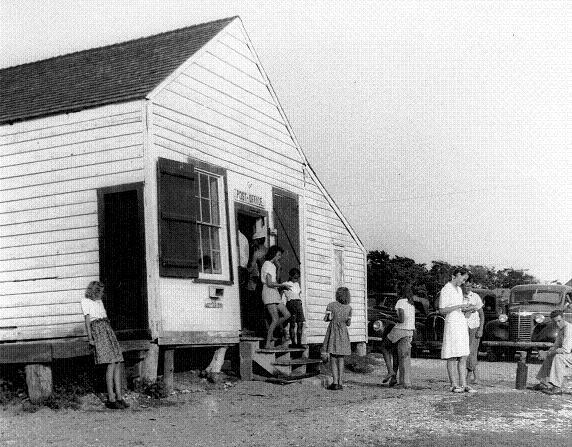 Ocracoke was no longer an isolated community with limited economic growth. Now new opportunities were quickly opening up. The last Ocracoker I know of to go north to work in Philadelphia was born in the 1940s. Captain Elisha Chase, born March 13, 1790, in Swansea, Massachusetts, was descended from a long line of New England sea captains and businessmen. His great-great-great-grandfather, William Chase (1621-1684), had emigrated from Chesham, England, to Yarmouth, Massachusetts, about 1642. His uncles, Aquila Chase II (1618-1670) and Thomas Chase (b. 1616) had moved to New England several years earlier. During his sailing career Elisha Chase occasionally anchored his vessel at Ocracoke. There he met and fell in love with Thurza Howard (1803-1835). They were married February 14, 1821. In 1834 Elisha and Thurza Chase sold their island property to Thurza’s brothers. With their three children, Elisha and Thurza left Ocracoke, and joined a wagon train heading west. 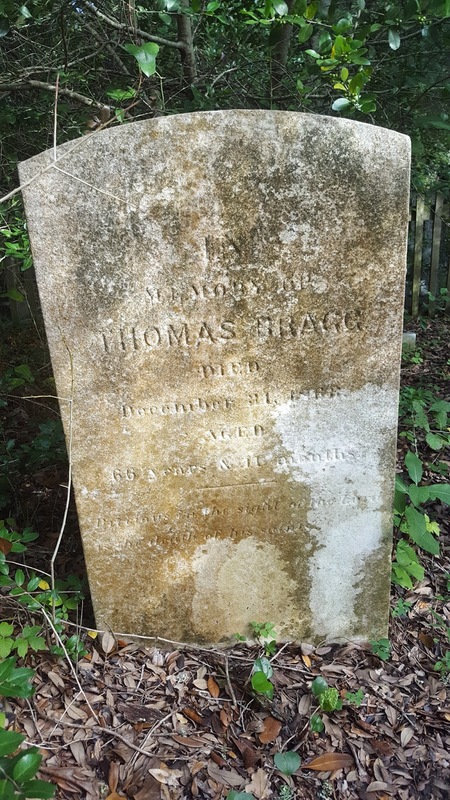 Thurza died en route; Elisha and his three children settled in Callaway County, Missouri, where Elisha soon became a merchant in the town of Portland, Auxvasse Township. 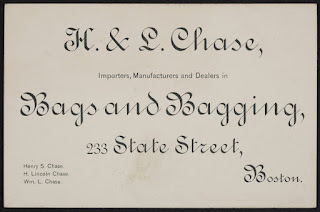 In 1866 a connection was established between the H & L Chase company of Boston (“importers, manufacturers and dealers in bags & bagging,”) and St. Louis, Missouri. 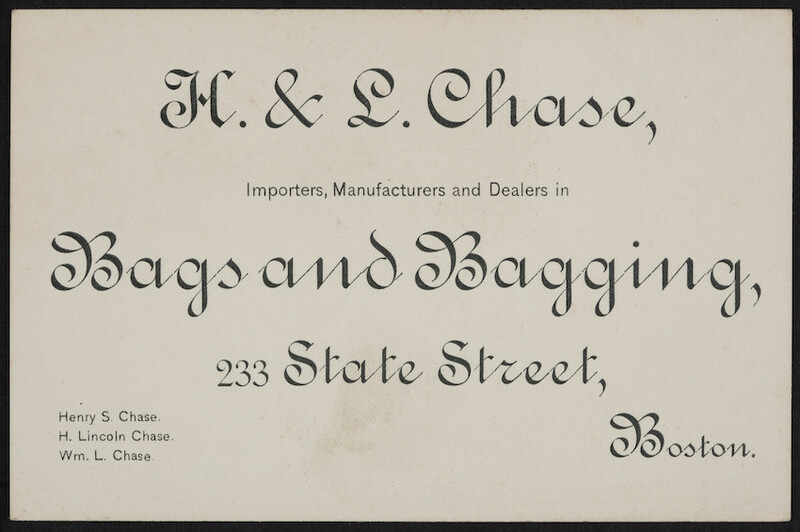 The Boston Directory for the year commencing July 1, 1870, lists 160 individuals or businesses with the name "Chase." A number of notable individuals were member of the Chase family, including lawyers, politicians, and clergymen. Salmon Portland Chase (1808 – 1873), Elisha's 6th cousin, served as the sixth Chief Justice of the United States from 1864 to 1873. Earlier in his career, he had served as the 23rd Governor of Ohio and a U.S. Senator from Ohio. Under Abraham Lincoln Salmon P. Chase served as the 25th Secretary of the Treasury. I am reminded of him every time I pull a $10,000 bill from my wallet. According to Mental Floss, " When the federal government started issuing greenback notes in 1861, Chase, as Secretary of the Treasury, was in charge of designing and popularizing the new currency. The politically ambitious Chase had to pick a portrait subject for the first $1 bill, and he chose Salmon P. Chase. "Although putting his face in everyone's pocketbooks never propelled Chase to the presidency, when the Treasury started issuing the new $10,000 bills in 1928 they put Chase's portrait on the obverse to honor the man who helped introduce modern banknotes. "Even if you don't have a $10,000 bill Chase's name might still be in your wallet. Chase National Bank, the forerunner to Chase Manhattan Bank, was named in his honor." Ellen Marie Fulcher Cloud (March 14, 1940 ~ December 3, 2016), 76, died Saturday, December 3, 2016, at Carteret Health Care in Morehead City, NC. Ellen Marie was a native of Ocracoke, the daughter of Mary Lillian Jackson and Elmo Murray Fulcher (originally from Harkers Island, NC). Elmo, along with George F. O'Neal, ran the iconic mailboat Aleta between Ocracoke and Atlantic, NC, for many years. 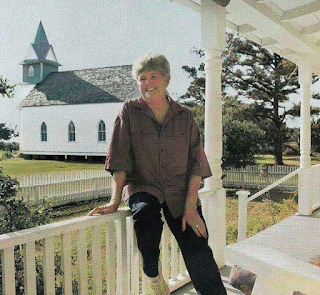 Ellen Marie devoted many years of her life working to preserve the heritage and culture of Ocracoke Island and Portsmouth Village. She was the author of several books, including Ocracoke Lighthouse. 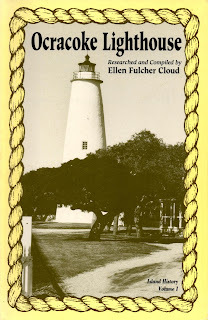 In Chapter 6 of her book, Ellen Marie recounts a personal lighthouse story, "The Great Window Heist." Several years before her death, she granted me permission to republish this story, hoping it would be an inspiration to others working in the area of historical preservation. As a tribute to Ellen Marie and her tireless work sharing Ocracoke culture and history with others, we have published the story as our current monthly Newsletter. You can read it here: http://www.villagecraftsmen.com/news012117.htm. A sailing ship's deadeye is a circular wooden block with a groove around the circumference to take a lanyard. They are used singly or in pairs to tighten a shroud (part of the ship's rigging that supports the mast). The deadeyes in the photo below were once used on Capt. Rob Temple's schooner, Windfall. Capt. Rob explained that modern sailboats often employ turnbuckles to take the place of deadeyes, but that some sailors still prefer deadeyes (traditionally made of Lignum Vitae wood). Lignum Vitae trees are indigenous to the Caribbean and the northern coast of South America. The wood is used because of its extraordinary combination of strength, toughness, density, and naturally occurring oils. Consequently, deadeyes rarely need to be replaced. It is believed that the name, deadeye, derives from the placement of the holes, which give the appearance of a skull (see photo above). In their book, Hoi Toide on the Outer Banks, The Story of the Ocracoke Brogue, Walt Wolfram and Natalie Schilling-Estes comment that "mixed in with general southern vowels on Ocracoke are several that are clearly nonsouthern, even if they don't necessarily sound distinctly northern." They go on to point out that "islanders fully recognize that the southern ah for i is a mainland pronunciation, not an island one." When eighth grade students heard a tape-recorded story told by a southerner who used the pronunciation raht tahm for "right time" they laughed and said, "That pronunciation sounds like Raleigh!" Just goes to show you...Ocracoke is different from the North, and different from the South too. Last week a reader asked about the Caswell and Zilphia Williams house that was moved sometime around the turn of the 20th century. I included Caswell and Zilphia's granddaughter's account of the move in our January 9 post. 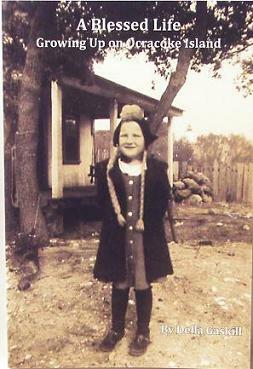 Della Gaskill wrote the account in her book, A Blessed Life, Growing Up on Ocracoke Island. The reader wanted to know if the house is still standing, and if there were any photos of the house. I visited Della a few days ago. She assured me she has photos of the house, but was unable to locate them. However, she reminded me that the cover photo for her book is a picture of her standing in the front yard, with the house in the background. The two story house is still standing, and retains it's original interior charm, although it has been raised and several rooms have been added. Caswell and Zilphia's great-grandson lives in the house today. Our latest Ocracoke Newsletter is Capt. Rob Temple's poem, "A Pirate's Christmas." You can read it hear: http://www.villagecraftsmen.com/news122116.htm. 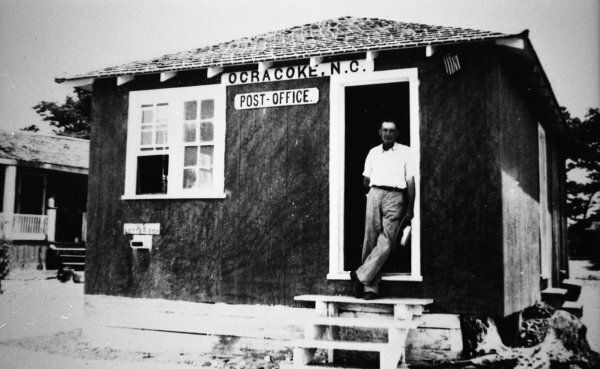 On August 21, 1840 the first post office on the Outer Banks of North Carolina was established on Ocracoke Island. For the next sixty years the post office was located in successive postmasters’ homes or in one of the village’s general stores. This is a photo of Abner Bennett Howard's general store and post office. It was located where Captain's Landing Motel is today. On October 21, 1902 postmaster Thomas Wallace (“Mr. Tommy”) Howard built the first of Ocracoke’s four dedicated post office buildings. It was situated across the road from Abner Bennett's store, between the entrance to Howard Street and the Silver Lake Motel. When Mr. Tommy retired in 1941 his future daughter-in-law, Elizabeth O’Neal, was appointed Ocracoke’s postmaster. Elizabeth moved her operation across the sandy footpath from Mr. Tommy’s small post office building to the old store which her father had purchased. 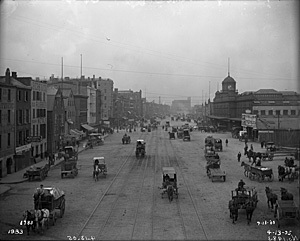 The original post office boxes had never been removed. 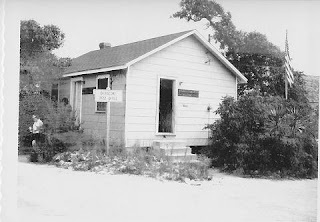 In 1952, after the old store and post office had been severely damaged in the 1944 hurricane, postmaster Elizabeth O’Neal Howard (Mr. Tommy's daughter-in-law), and her husband Wahab Howard, had a new, 18’ X 24’, 432 square foot post office built on their property near the old store. The new post office had 150 lock boxes. The building has since been moved. Down Point Decoys is located on that property today, just a few feet south of where the post office stood. 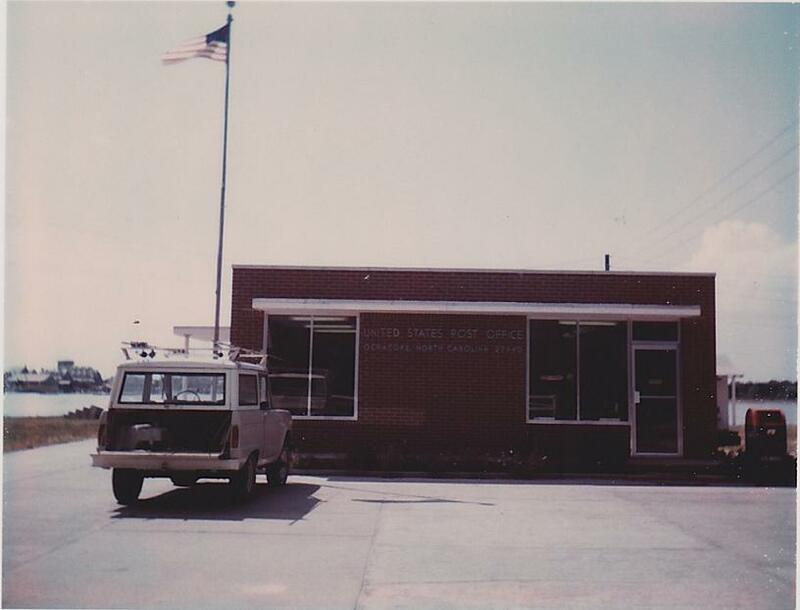 In 1964 a new brick post office with 1000 square feet of interior space and 464 lock boxes was constructed. Today it houses Captain's Cargo gift shop. Ocracoke's current post office was relocated to NC Hwy 12 in 2000. 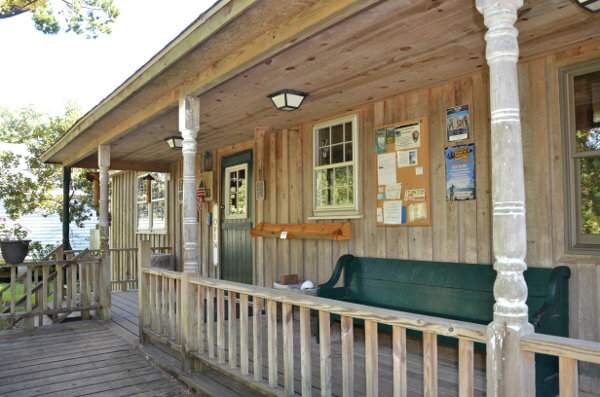 Today, the 3,000 square foot Ocracoke post office building, with 1256 lock boxes, serves nearly 1000 year around residents and businesses as well as numerous summer visitors. 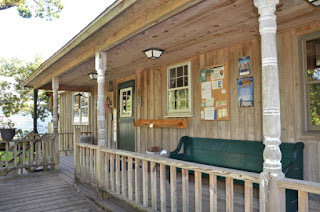 You can view more photos, and read more about Ocracoke's post office at https://www.villagecraftsmen.com/news042113.htm or https://www.ocracokenavigator.com/old-post-office/. Recently I was looking over a 1990 issue of the Ocracoke Island News when I noticed a number of advertisements for businesses that are no longer operating on the island. Here is what I discovered. Some of the businesses in the first category have simply closed. Most of those business owners no longer live on the island, but some have retired, and still live here. Other businesses have been sold, closed for a time, and then reopened under new management and new names. We are happy to say that Village Craftsmen, established in 1970 by Philip Howard, continues in operation, now under the capable management of Philip's daughter, Amy. Although Village Craftsmen is closed in January & February, be sure to stop by in the spring, or on your next visit to the island. We are regularly adding additional fine quality American handcrafts to complement our exciting assortment of pottery, glass, wooden items, jewelry, and much more. In the nineteenth century and early twentieth century the federal government appointed wreck masters in coastal communities. These individuals were empowered to take charge of cargo and other goods thrown on shore after a shipwreck. Of course Ocracokers and other Outer Bankers often snatched up whatever they could manage to salvage before the official wreck master could gather the items together and protect them from looters. Once collected, the wreck master contacted the shipping agent who arranged for a vendue, or auction. The vendue (an old French word) was the occasion for much excitement in coastal areas. Residents and visitors would gather around for the entertainment as much as for the opportunity to purchase items at bargain prices. 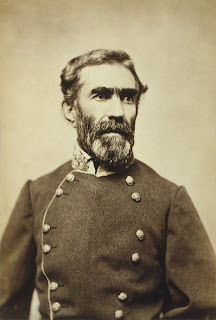 Late last year a reader asked if there was any connection between Confederate General Braxton Bragg and the Braggs of Ocracoke. After several hours of research I learned that General Bragg (1817-1876) was the great-great-great-great-great-great grandson of Thomas Bragg (who was born in England in 1579 and immigrated to Virginia) and Mary (Molly) Newport. I also learned that General Braxton Bragg was the grandson of John Bragg (1741-1799) and Hannah Tolson Bragg of Ocracoke and Portsmouth Islands. 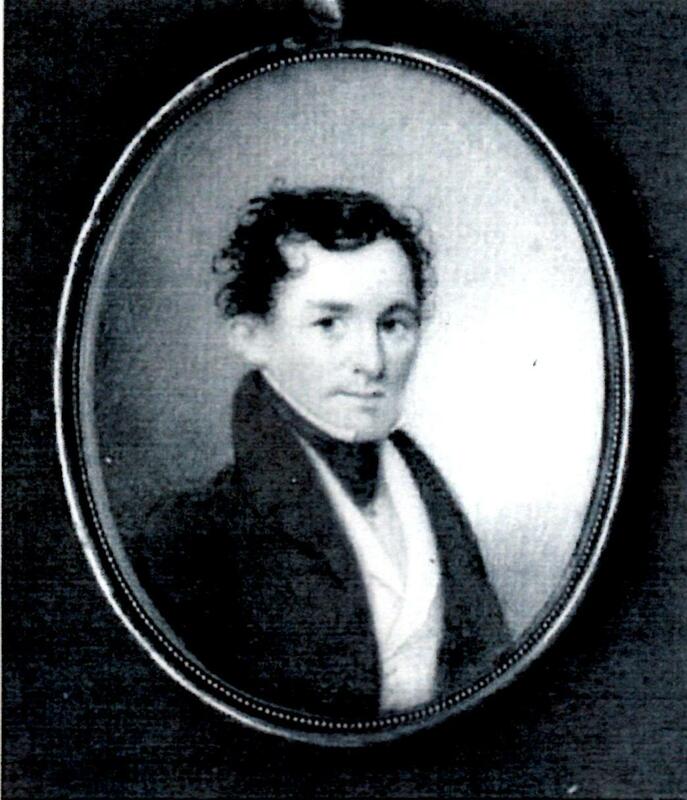 His father was Thomas Bragg, Sr. (1778-1851). General Braxton Bragg came from a distinguished family. His brother John (1806-1876) was an editor, lawyer, judge, and a member of Congress. Brother William (1819-1863) was a captain in the Confederate service, and was killed at Chattanooga. Thomas (1810-1872) became the 34th Governor of North Carolina, and served as the Confederate Attorney General. For some time I have known that the forefather of all the Ocracoke Braggs was Jesse Bragg (b. ca. 1765/1770). * Oral history identifies Jesse’s father as John Bragg who married Hannah Tolson. 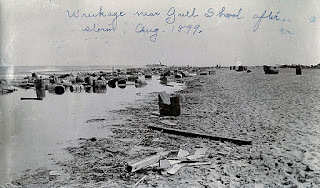 There is a legend on Ocracoke about "Old Quawk" (see http://villagecraftsmen.blogspot.com/2015/03/old-quawks-day.html). Oral history has it that Old Quawk offered a bag of gold to any man who would marry his daughter. Older islanders remembered people referring to Jesse Bragg's wife as "Sally Quawk." Jesse and Sally Bragg had a number of children. One of their sons, Thomas Bragg (1797-1863), is buried on Howard Street. Although I have not been able to find any reference to Jesse Bragg in various on-line genealogical web sites, the connection with John and Hannah Tolson Bragg seems secure. Thus, Thomas Bragg, Sr. (1778-1851), General Braxton Bragg’s father, would be Jesse's brother, making Thomas Bragg (1797-1863) of Ocracoke and General Bragg 1st cousins. *Jesse Bragg is listed in the 1790 Federal Census of Ocracoke as Head of Household. In 1800 he is listed as being between 16 and 45 years old. In 1810 he is 45 or more years old. Thus, a good guess is that he was born ca. 1765-1770. Separate eggs. Beat the whites until stiff. Add sugar, a little at a time and beat well. Add egg yolks and lemon extract. Pour sauce over dumplings. Ready to eat! Yum, yum, delicious! To read more about traditional Ocracoke Island cooking (including blackberry dumplings and much more) see David Cecelski's interview with island native, Maude Ballance (born 1932), "Listening to History," in NCPedia.org. 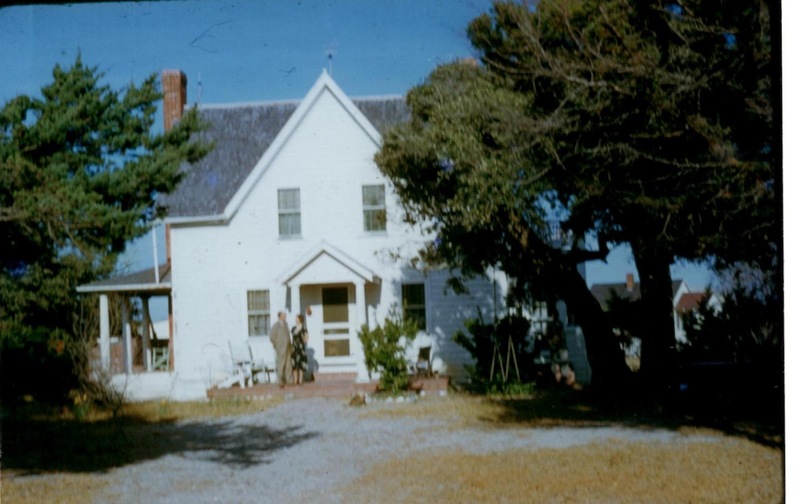 Many a building on Ocracoke has been moved -- the Island Inn, Sorella's Pizza & Pasta (formerly the Ocracoke Pizza Co.), the old Assembly of God Church, Coyote Music Den, the Ocracoke Preservation Society Museum, the Ocracoke Oyster Company, Down Point Decoys, other businesses, and numerous private homes. "When my grandmama and my grandfather, Papa Cas [Richard Caswell Williams (1884-1959)] and Zilphia [Zilphia Gray Styron (1886-1966)], were going to get married, my grandfather built a house around the other side of the Island by what we call the Creek (Silver Lake Harbor.) The house was built around where Chris and Mabel Gaskill lived [near British Cemetery Road]. After my Papa built the house they were getting ready to get married and my grandmama told him that she weren't going around the Creek to live, so my grandfather had a boat, and he had to take that house down piece by piece and bring it around the shore side in back of my mama's house and bring it piece by piece down where the old home place stands now... I guess there probably were men that helped him take it down and move it by boat until they got it all down there where they built it on the land where it sits today, the old home place [near the Assembly of God church]."